A black and white photograph of 173 Brock Street North. This building was constructed in 1862 by John Ham Perry as the office of the Whitby Chronicle, published by William H. Higgins. An addition was built to the north circa 1900. 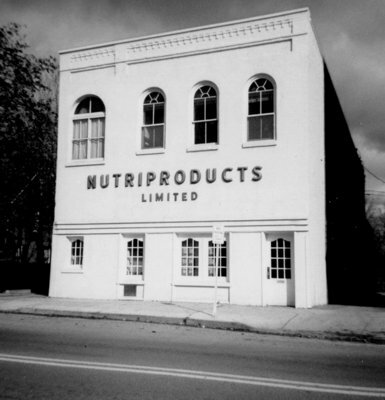 In the 1960s until 1977, it was the home of Nurtriproducts Limited, a food processing form for the hotel industry. The company's large transport trucks bore the name "Nutriproducts Limited, New York, Montreal, Whitby". Perry, John Ham ; Winter, Brian ; Higgins, William H.
173 Brock Street North, October 24, 1965, Brian Winter. Whitby Archives A2013_004_001.